Ignoring the user agreement is folly here. Tiny print telling you why these people are scam artists and not business types. Unfortunately along with the millions of others who can’t be bothered in the every day rush, hopeful trust gets the better of everyone sometimes. Moving on to the next page begins setting off alarms as suspicion builds…. Instead of moving on to the promised page where presumably one may apply to this supposed job “Step 2 of 3” suddenly appears. The true purpose of JobsRadar becomes a little clearer as an advertisement for trade school unravels before the careful reader. Now maybe some people see an ad for school (which costs $) while applying for a job (which pays $) and say “This is it Linda! I’m going back to school. JobsRadar just pointed me in the direction my life needs to move!“ To which Linda replies “That’s great Ted. Did you remember to take the garbage out?“ in her typically petulant tone. After finding the mostly invisible box allowing you to skip onward a second ad for something the same but different lurches onto the screen. Foiled again. Finally reaching the page where one may presumably apply for this job leads only to disappointment once more. Reality finally clears things up as it all becomes obvious. 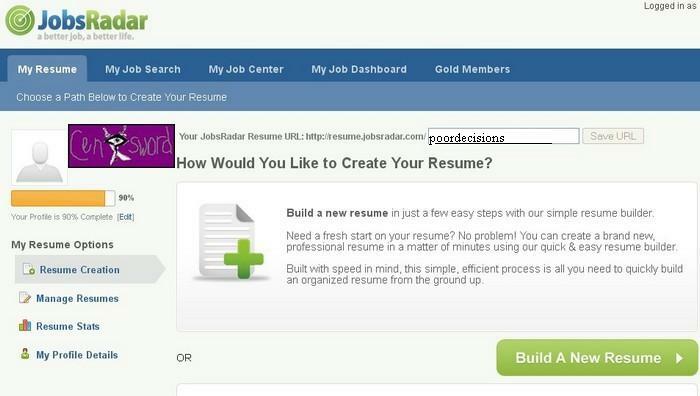 JobsRadar is merely an aggregator, pulling together information from other sites across cyberwaste. 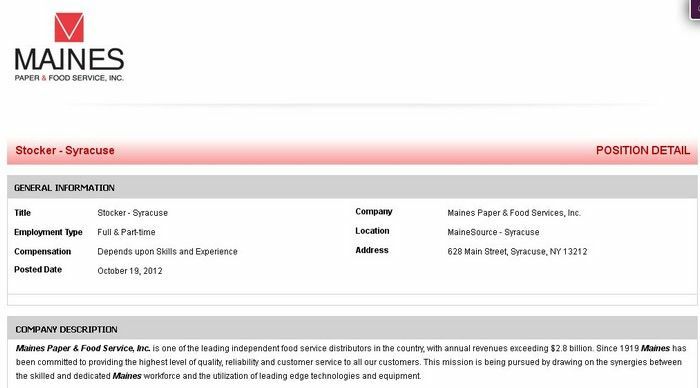 A few more clicks and rerouting through several other websites leads to the actual job posting, hosted elsewhere. While some may be happy after finally reaching the application process questions began to arise as to the motives of a site allowing free membership and doing virtually nothing beside shoving ads down users’ throats. A “$gold membership$” was available, but after scanning quickly through the listings there did not seem to be any real benefit. Realization is an ugly thing at times. Slogging through the user agreement quickly confirmed the worst. 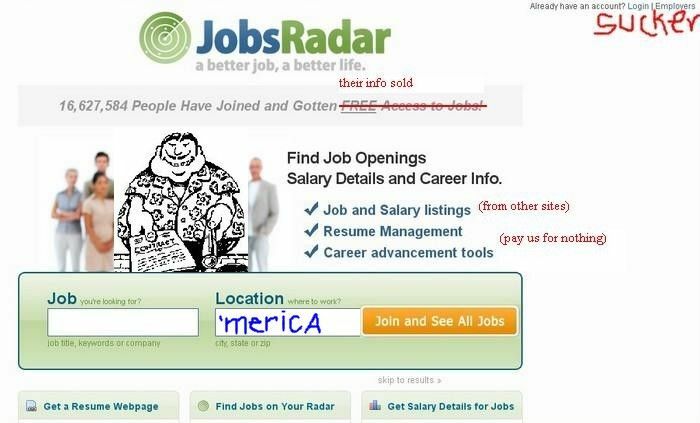 JobsRadar is nothing other than a slightly useful front for gathering personal information to sell to third parties. While less valuable than social security numbers, addresses physical & virtual alike are profitable commodities in the wild wild web (wickey wickey wickey). Treachery afoot, a search for the delete button took place to no avail. Digging through the interface found nothing. Resorting to oogling located the necessary information in tiny type buried on a page on their site. More bad news about escaping their clutches once the trap was sprung. Sent the email a few minutes later. Not the most gracious of requests, but sufficient nonetheless. No response thus far and attempting to go to the site only tries to log in users, tracking you. They know it’s you coming… creepy… Maybe Sandy destroyed their office and if so best wishes on recovery efforts, but the belief in integrity and human kindness wanes a bit more each year. So beware! 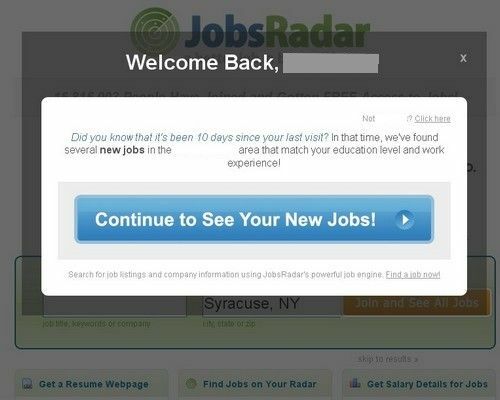 JobsRadar is merely another interweb scam artist looking to sell your information, joining the proud ranks headed up by many of the digital world’s disgusting peeping toms. All the information it holds is accessible elsewhere. Don’t let others sell you. This entry was posted in Actual News and tagged censword, cyberwaste, digital stupidity, failonomics, false hope, jobsradar, scam, societal collapse. Bookmark the permalink. I am sick of these damn scam job sites. I think I am applying for a job, then the next thing I know, those SOB’s are burning up my phone line. place you have placed my information. Please do not call or send e-mails to my address. 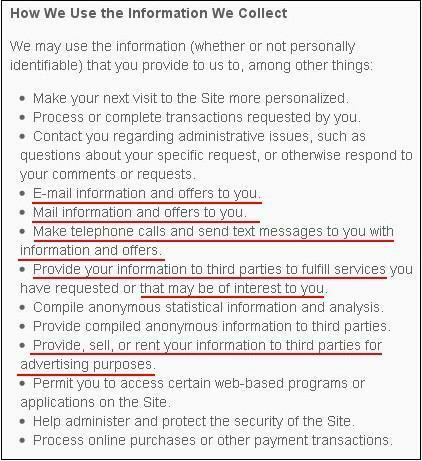 Do not contact me nor give my information to any other website. When it gives you a number to call, an 855#. 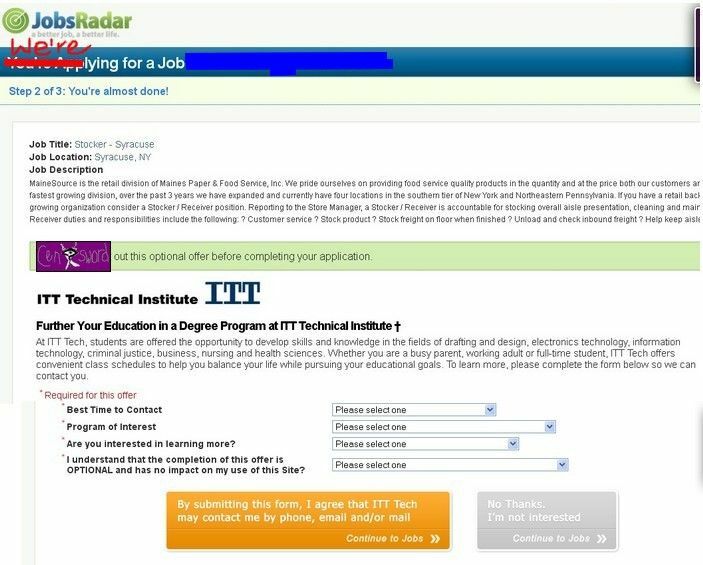 It’s not jobsradar you’re calling an ‘education advising service’ so the can collect your info and trying to get you to donate your information to sell for forprofit colleges. I know someone that works for jobs radar. Yes its true that its a scam. You think that you’re on the site looking for a job but they make you call in to verify your information but its just a way to try to convince you to go to school. My friend hates working there cuz he hates scamming people but they pay VERY WELL and offer awesome benifits. But I do warn people dont use this site. i used to work for these people. they are all giant assholes, it is a huge scam and pretty masterfully orchestrated. 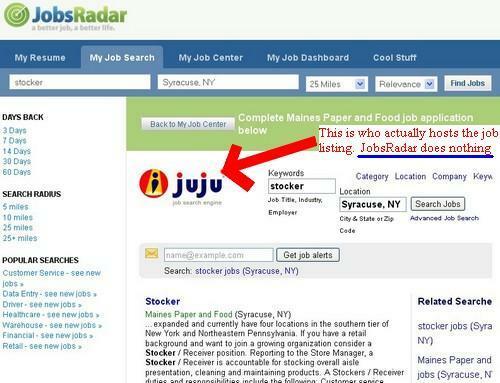 jobsradar, gigats, everyjobforme, essentially every free job search site out there are all owned by the same company, plattform advertising. they do in fact collect and sell all the information you enter into those site, mostly to for profit colleges (a huge scam in and of themselves). in fact, an entire branch of plattform advertising, a child company called liquid education, exists solely to recruit users of the websites for the above mentioned colleges. to even sign up for the website you agree in the fine print to be contacted by telephone by a liquid education recruiter, and any phone number the site might prompt you to call (in order to complete registration, clarify additional information, even tech support) all direct you to a liquid education recruiter who is instructed to steer the conversation towards getting you in touch with a school. the recruiters can even go so far as to email you fake job applications in order to maintain the ruse that this is anything other than a bait and switch scam. the site itself contains no actual information on any sort of available job. plattform will actually buy ad space from google to post links to their sites. 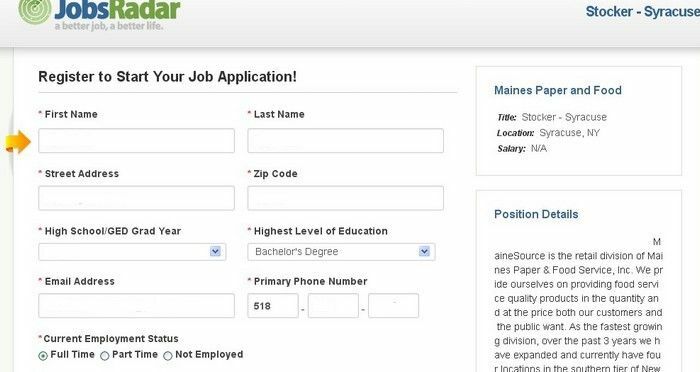 google search “mcdonalds application” for example and the number one hit will be an ad for a jobsradar site masquerading as a mcdonalds career site, praying on those who are not tech savy enough to fill out a real online application. ex-employer is corrected about everything. Liquid Education is a company that is owned by PlattForm Advertising, and they’re in association with many of these for profit schools. I went to an “interview” (really an orientation) at this place and they basically tried to “sell” the company. They were pretty condescending about the whole thing, like the interviewer would say “most of these people are looking for minimum wage jobs like warehouse work or fast-food.” Basically the interviewer admitted that it’s the rep’s job to make the person re-think their job choices and plant the seed in their brain to considering going to school. To these horrible for profit ones. It’s unethical all around.